Rising bass fishing star Greg Springer with the one that didn't get away. Rising big bass star Greg Springer of Vista has caught and released the largest bass in San Diego in almost two years, a truly massive 16.3 pounder. Springer landed the fish on Friday at Escondido’s Lake Wohlford near the South Shore Rockpile, while fishing from the shoreline with a 3:16 Lure Company Kokanee Glide Bait (pictured in one of those photos below). 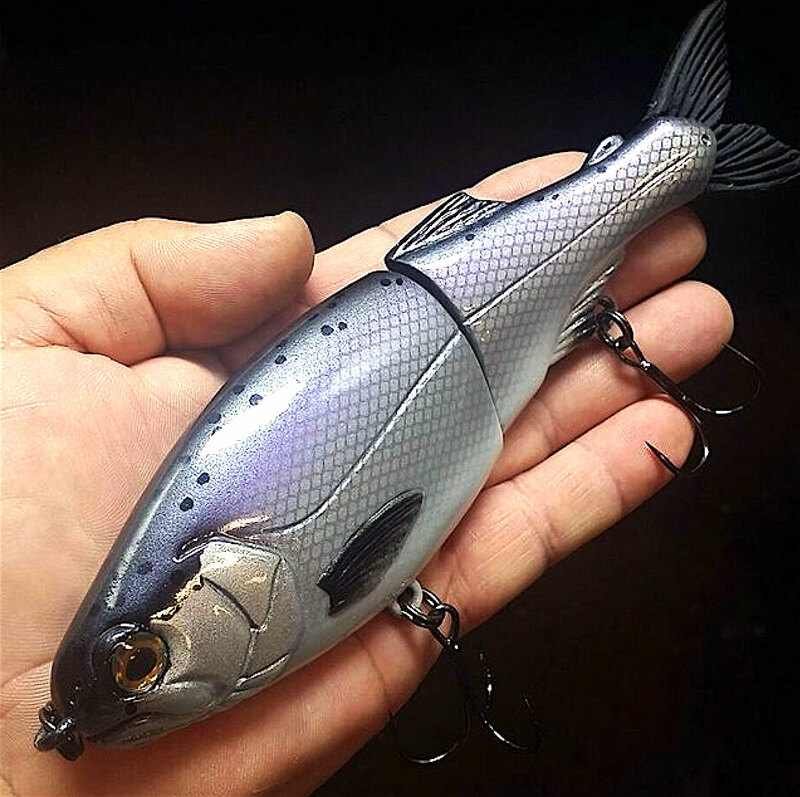 A 3:16 Kokanee Glide swimbait just like the one used by Greg Springer. Springer had been on a mission to catch this specific bass, after getting a glimpse of her on two previous trips – the first time being the previous Friday when she followed his swimbait. He checked in on her again on Thursday, and saw her rise up behind a big topwater bait he was throwing. After running some errands on Friday, he popped in again to see if she was ready to take the jump from follower to biter. With glassy water conditions, Springer launched his swimbait in the direction of where he’d seen her previously, “she immediately came up and slapped the bait, but I missed her.” Perhaps getting too good of a look at the bait with the glassy calm conditions, and aborting at the last second. So Springer moved on, chucking his bait down the shoreline toward the buoy line. “When I saw the wind come up in that area, I went back over there and she crushed it on the first cast,” he said. The key to finally closing the deal with this particular fish was persistence, timing and recognizing when conditions can work in your favor as opposed to against it. I’ve only caught five bass this year, but three of them have been double-digits. Greg is no stranger to big bass, and things seem to be coming together for him lately especially. He caught a 12.08-pound fish at Lake Skinner just a few weeks ago, breaking his previous best mark at the time – and this 16.3-pounder obviously raises that bar again for him. And this isn’t the only 16-pound bass he has had his hands on lately. He was fishing with Ryan Block at Lake Skinner on March 22nd – the day that Block caught and released a 16 lb. 2 oz. fish. Springer was the one to dip the net under that fish for Block. In another twist of irony, Block and Springer had planned to fish Skinner together yesterday, but that plan was altered after Block’s trip to Skinner on Thursday yielded no reason for a return trip on Friday. 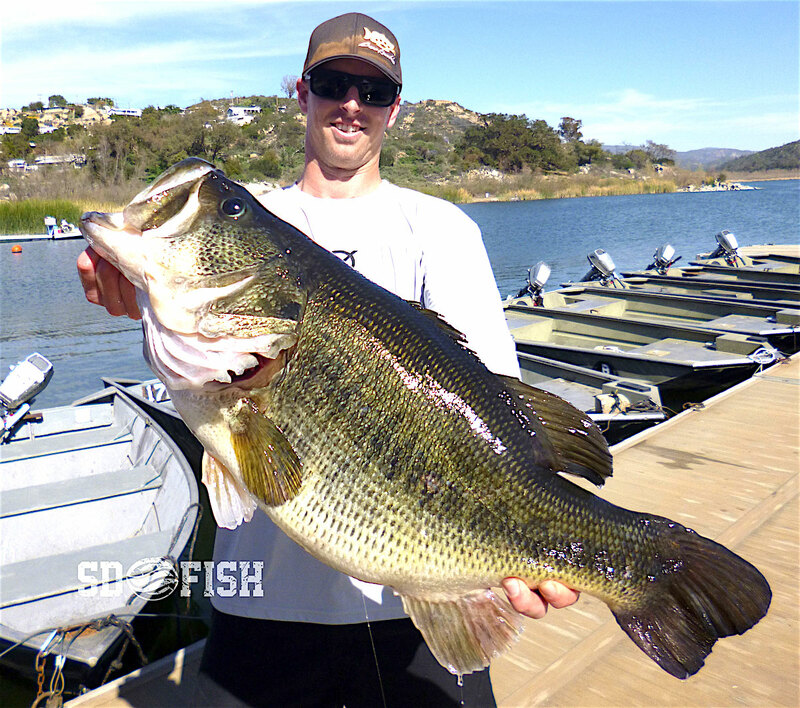 Springer’s fish is the largest bass caught in 15 years at Wohlford, what had historically been one of San Diego County’s top producers of big bass, naming it on a short list of local lakes that was capable of possibly producing a world record largemouth bass. While that hasn’t happened here yet, the existing lake record at Wohlford stands at 19 lb. 3 oz., caught in February of 1986 by Steve Beasley, and that puts it 5th on the list of lake record bass in San Diego County, behind only Morena, Hodges, Miramar and Dixon. Lake Wohlford regular Mike Kostial of Escondido landed a 14.9 pound bass at Wohlford in February of 2011, and the lake has kicked out dozens of 8-10 pound fish since, but nothing approaching Springer’s latest catch. Rising bass fishing star Greg Springer with the one that didn’t get away. To see more of Greg Springer, you can follow him on Instagram and don’t forget to follow our new Instagram account as well for sdfish.com. Lake Wohlford is currently open daily from 6 am to 6 pm. Private boats are not permitted at Wohlford due to the threat of Quagga Mussels. Rental boats are available, though they’ll no doubt be limited in the coming weeks due to the attention this catch with garner. The water temperature is being reported at right around 60 degrees on the surface. The warming water due to longer days and warm weather has triggered the bass to hit the shallows. Want to see other GIANT BASS? Check out these big bass catches! Kellen Ellis is the fishing fanatic behind SD Fish.com, the leading local resource for all things fishing in San Diego county and beyond. Established in 1996, SDFish.com is the original and best online source for San Diego fishing news, fish reports, and community forums. By permission, The Grapevine is reprinting some of Kellen’s fishing-related reports and then some. Stay tuned for more and visit http://sdfish.com. Be the first to comment on "MONSTER ALERT! 16.3-pound bass caught at Lake Wohlford"